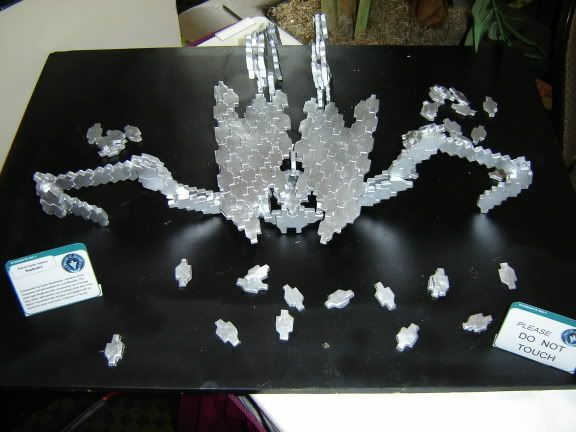 Does anyone have the plans for assembling a replicator out of the molded chips? Also, while I have a chip to create a mold from, can anyone suggest the correct materials to make the mold, as well as, the chips themselves? Yeah, I've seen the stuff as well. I'm just interested in getting a discussion going on these threads and wanted to find out exactly what materials make the best molds and best chips. Info on where to buy the stuff would be highly benificial as well. Last time I didn any molds was for metal BattleTech minitures and that took a special type of mold material etc. I have heard and read that clay is a good medium to use to make a mold for the resgn or plastic but you would need a piece to form the mold unless you can eyeball it. Cavin and I have been here and done this.....LOL. Makeing a "master" from scratch was hard alone....we used clay. we used "alumilite" I think.... it's a starter kit for resin....but we first got some bad airpockets that would not give a good cast. What we ended up doing just so that we had a product for a con...was do do the whole object in clay....but not chip by chip.....instaed a full wing or leg would be done in clay and once cooked we glues them together.....and then spray painted it for right color.....Matt you may find a starter kit for resin at places like Hobbytown USA....theres one in Frederick. Well with Carl's help I got a single-sided Replicator chip mold made... I will use it to make chips and then also remodel a chip to make a double-sided Replicator chip and make a new mold. In this way we'll be able to make both typs of chips which will create a better Replicator model. Way back when..... Cavin and I did not have a mold of a "real' chip and we made our own from clay....then made a replicator. Some of you have seen it before.....but here's a pic for those the did not. Considering this project was started from scratch without a real chip...it was awsome. The problem with the baked clay was that it was heavy, and the glue was not strong enough to support the weight. I wonder if foam or balsa wood might have possibilities for this project. Balsa wood would be easier to "replicate" because you don't have to carve the parts, and the finished product would still be light and somewhat strong. <b>Sheppard:</b> How's it coming, Rodney? <b>McKay:</b> Slower than I expected, but faster than humanly possible. That's the beauty of starting from scratch....you can improve on the design and put your own "flavor" to it and add it in as part of some alternate"verse" in the expanding world of SG. I would suggest making the mold with silicon rubber, i myself use rebound 25 from smooth-on, you could re-cast one of the prop pieces you can buy for like $30-40 from various places or you could sculpt one yourself from sulfur free modeling clay. To cast you could cold cast using aluminum (this would give it a really cool authentic look, or you could use resin, which is quick, light and strong. From there you just need to make enough pieces and somehow put them together. If anyone has any other questions about molding and casting please ask! Did you go any further with the Replicator project DerinL? I just fond this old thread after starting to think that building a replicator would be fun the other day. NAME: ... that new guy Dr Jackson dragged in. ASSIGNMENT: ... dont know yet, but it seems to have something to do with those early Asgardian artefacts SG1 found on Nifelheim. I hope you like Guinness, sir. I find it a refreshing substitute for... food. Col. Jack O'Neill. Lost City, part 1.